Actor Saif Ali Khan loves American muscle. The man already has a previous generation Ford Mustang, and now has just added a really powerful Jeep to his garage. We’re talking about the Grand Cherokee SRT, the most powerful Jeep that money can buy in India. The SRT Jeep features a 6.4 liter V8 supercharged engine that puts out about 470 Bhp of peak power and 624 Nm of peak torque. An 8 speed automatic transmission is standard, along with an all wheel drive layout. Fuel efficiency? Don’t ask. This one’s a gulper. You should be pleased to get about 5 Kmpl. The Cherokee SRT can hit 100 Kph standstill in a blazing 4.8 seconds. Keep the throttle pinned and soon you’ll have this SRT-badged missile touching its 257 Kph top speed. No slouch this SUV. Why, it can shame many sportscars with its visceral performance. Priced at 1.3 crore rupees in Mumbai, the Grand Cherokee SRT sits at the very top of Jeep’s SUV line-up in the country. The SUV was first introduced last year, as a brand-builder for the American brand. It’s imported as a completely built unit (CBU) from the United States. Jeep also sells naturally aspirated petrol and turbo diesel versions of the Grand Cherokee in India. Both these vehicles are priced much lower than the SRT variant despite being imported through the CBU route. Both the 3.6 liter, V6 petrol and 3 liter, V6 diesel-engined Grand Cherokee variants start from around 85 lakh rupees. 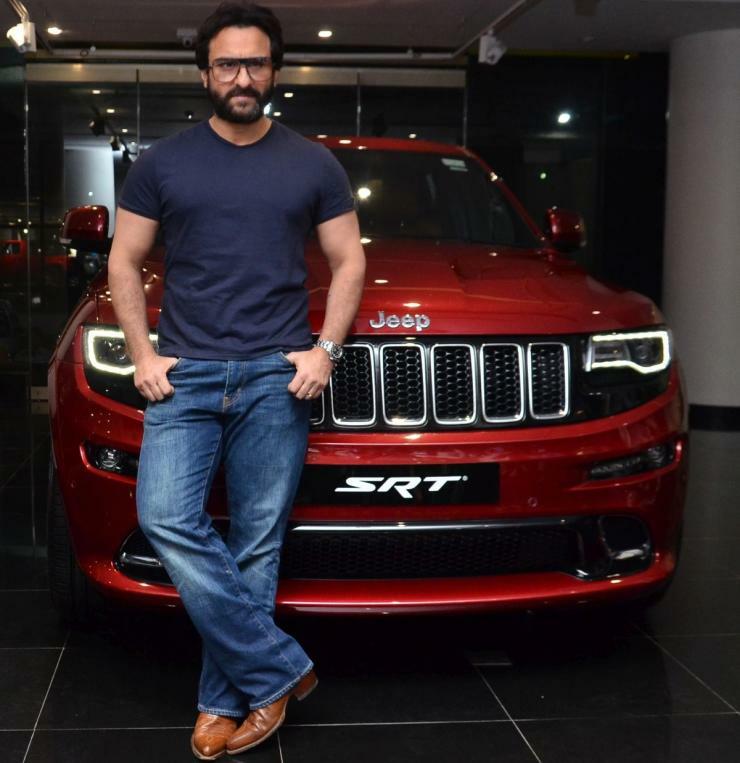 Meanwhile, Kevin Flynn, the CEO of Fiat Chrysler India handed over the keys of the Grand Cherokee SRT to Saif Ali Khan. It’s unclear as to whether Saif paid the full 1.3 crores that the high-performance luxury SUV costs, or if he got a sweetener considering his celebrity status. In India, it isn’t uncommon for celebrities to get heavily discounted high-end luxury luxury in exchange for brand promotion. Something similar could have been the case with Saif and his Grand Cherokee SRT but we have no real way to know as most such deals are shrouded in secrecy.